Copenhagen Zoo (Danish: København Zoo) is a zoological garden in Copenhagen, Denmark. Founded in 1859, it is one of the oldest zoos in Europe and is a member of EAZA. It comprises 11 hectares (27 acres) and is located in the municipality of Frederiksberg, sandwiched between the parks of Frederiksberg Gardens and Søndermarken. With 1,161,388 visitors in 2008 it is the most visited zoo and 4th most visited attraction in Denmark. The zoo is noted for its new Elephant House designed by the world-famous British architect Sir Norman Foster. The zoo maintains and promotes a number of European breeding programmes. 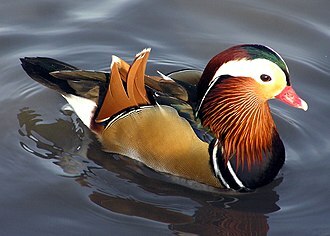 Copenhagen Zoo was founded by the ornithologist Niels Kjærbølling in 1859. 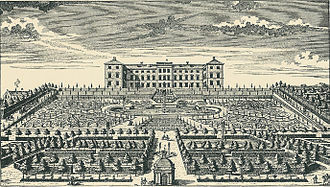 He was given the summer garden of "Prinsess Vilhelmines Have" (The garden of Princess Vilhelmine) by the chief directorate of Copenhagen. The animals that the visitors could contemplate at the opening were eagles, chickens, ducks, owls, rabbits, a fox, a seal in a bathtub and a turtle in a bucket. In the early years the zoo focused on showing as many different types of animals as possible, but as animal welfare later became an issue, the number of different species has dropped in favour of more space to each animal. 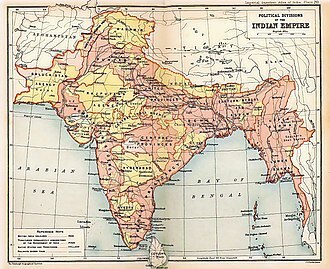 In 1901 the zoo had a human display with 25 Indians- men, women and children- in an exhibition where the "brown exotic" people went about their daily lives in palm tree leaf huts constructed in the middle of the zoo. One of the most notable animals kept there was a male slow worm that lived there from 1892 to 1946 (for 54 years, which is a record among lizards). Starting in the early 1980s, Copenhagen Zoo has been undergoing a renovations aimed at replacing cages with enclosures which recreate animals' natural environments, giving a better lifestyle to the animals, and a more realistic experience to visitors. 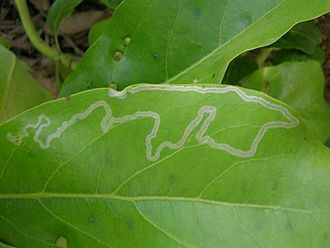 The Elephant House and 1.5-hectare (3.7-acre) Savanna are results of these efforts. The Savanna includes a Hippopotamus House where the hippos can be watched underwater. The zoo has preserved many of its historical buildings. The oldest building still in use, a stable for yaks, was erected in 1872, and now houses the bactrian camels. A Herbivore House built in 1875 still houses herbivores, namely tapirs. 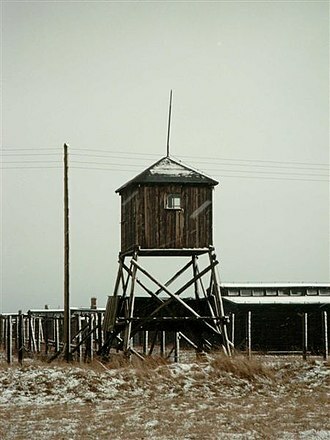 An owl tower from 1885 is today left as a memorial commemorating how zoo animals were once kept. A notable and highly visible feature of the zoo is the wooden observation tower. 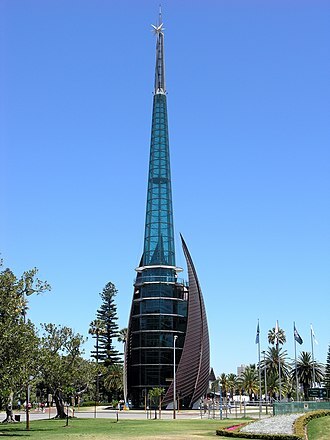 43.5 metres (142.7 ft) high, it offers views of the surrounding parklands and city. 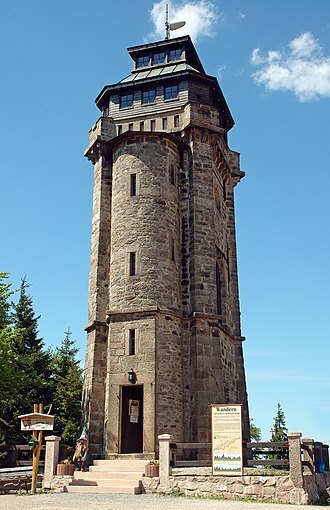 The tower was built in 1905 and is one of the tallest observation towers built of wood in the world. Its base is similar to that of Eiffel Tower. Animals exhibited at the zoo that are not housed in any of the main areas include bactrian camels, American flamingos, scarlet ibises, roseate spoonbills, Dalmatian pelicans, turkey vultures, Humboldt penguins, California sea lions, black-capped squirrel monkeys, chimpanzees and lions. 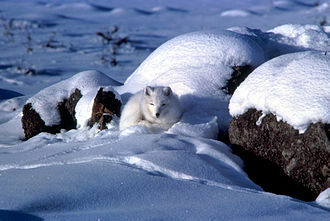 In the part of the zoo called "The Nordics" (Danish: Norden), visitors can see species such as harbour seals, snowy owls, reindeer, musk oxen, brown bears, arctic foxes and grey wolves. The "Arctic Ring" (Danish: Den Arktiske Ring), which opened in 2013, has an exhibit for polar bears (including a tunnel allowing underwater views) and an aviary for North Atlantic seabirds (alcids). In the "Asia" (Danish: Asien) section, visitors can see Oriental small-clawed otters, red pandas, Malayan tapirs, Amur leopards and tigers, Asian elephants, and other animals. 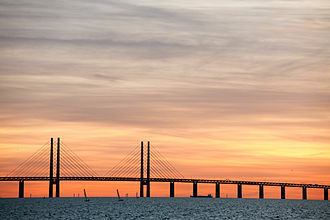 The new Elephant House, which opened in June 2008, is designed by Norman Foster in cooperation with the Danish landscape architect Stig L. Andersson. It houses Asian elephants, and contains two glass-domed enclosures. One is for cows and calves and measures 45 by 23 metres (148 by 75 ft). The other is 30 by 15 metres (98 by 49 ft) and is for bulls, kept in separate pens during the mating season for fear of fights. The building also contain an exhibit space and a small lecture hall. The enclosures open out through mighty rusted steel doors into am almost 1 hectare big landscaped paddock with a pool 3 metres (9.8 ft) deep and 60 metres (200 ft) long. The paddock's border with Frederiksberg Gardens, once a 3-metre (9.8 ft) high wall, has been opened up so that people in the park can now watch the elephants. This has been done because the zoo, with its central location is very much a city zoo, wants to integrate with the urban landscape. At the same time it affords the elephants distant views of open parkland and ancient trees, which prevents them feeling too enclosured. Most of the "Africa" (Danish: Afrika) section is taken up by the "Savanna" (Danish: Savannen) area. This is an open field with a visitor bridge above containing species such as white rhinoceroses, giraffes, impalas, sable antelopes, ostriches and plains zebras. The hippopotamuses, which have their own separate enclosure, also has partial access to the Savanna. Other species in the Africa section are okapis, Abyssinian ground hornbills, Congo peafowl, caracals and meerkats. The "Tasmania" (Danish: Tasmanien) section is unique to Copenhagen Zoo. The section was started after the wedding of Frederik, the Crown Prince of Denmark and the Tasmanian native Mary Donaldson in 2004, where the Tasmanian government gifted four Tasmanian Devils to the zoo. These were the first Tasmanian devils to live outside of Australia. The area has since been expanded with a combined area for red-necked wallabies, Eastern Grey Kangaroos and common wombats. Parts of this area is also accessible by visitors, allowing kangaroos and people to cross paths. In the "South America" (Danish: Sydamerika) section, visitors can see species such as capybaras, guanacos, greater rheas, Patagonian maras, southern screamers and giant anteaters. They all have access to one common area, modeled after the South American pampas. The "Tropical Zoo" (Danish: Tropezoo) consists of a rainforest hall with one section for free-ranging birds, turtles and two-toed sloths and another for tropical butterflies and West African crocodiles. In between the two is a section for reptiles, amphibians, fish and the rare Java mouse-deer. In the Children's Zoo (Danish: Børnezoo), visitors can see farm animals and small domestic animals, such as llamas, goats, cows, pigs, horses, chickens and rabbits. For several years, Copenhagen Zoo was the only zoo outside Australia that had Tasmanian devils,[unreliable source?]. They bred for the first time in Copenhagen Zoo in 2013 and the two females gave birth to a total of seven young. Other rare species and subspecies kept in the zoo include: Schmitz's Caracals, Cape Weavers, Black-necked Weavers, East African Chimpanzee, Yellow-headed Amazon, Pink-tongued Skink, Tasmanian Wombat, Tasmanian Eastern Grey Kangaroo, Banded Razorbill and West African crocodile; all of which are rarely kept species in European zoos. Copenhagen Zoo has the rare Amur leopard, okapi, and muskox. A healthy young male giraffe, Marius, was killed on 9 February 2014 on the recommendation of the European Association of Zoos and Aquaria. His meat was fed to the zoo's lions, while other parts were transferred to a scientific institution. The scientific director at Copenhagen Zoo, Bengt Holst defended the culling, saying that the giraffes at the zoo bred very well, and where this was the case, giraffes had to be killed to ensure the best genes were passed down to ensure the animals' long-term survival. He confirmed the zoo typically culls 20 to 30 animals every year. The death occurred despite offers from other animal institutions (EAZA member Yorkshire Wildlife Park (YWP) in the United Kingdom and Hoenderdael Park in The Netherlands) to take the giraffe. YWP released a statement that it had the capacity to accept a further giraffe into its bachelor herd in its state-of-the-art giraffe house built in 2012, and that contact had been made with Copenhagen Zoo but no reply had been received. YWP has previously received a male giraffe of the same age as Marius from Copenhagen Zoo. Bengt Holst stated that the capacity at YWP would be better utilised by a giraffe whose genes were less represented amongst EAZA zoos. 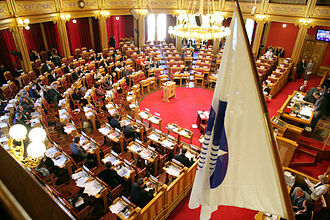 The action was criticized by Stine Jensen from Denmark's Organisation Against the Suffering of Animals, who repudiated the action as unethical. She said, "This situation should not have occurred at all. It just shows that the zoo is in fact not the ethical institution that it wants to portray itself as being, because here you have a waste product - that being Marius. Here we have a zoo which thinks that putting this giraffe down instead of thinking of alternatives is the best option". Images of the carcass being cut up in front of children and then fed to the zoo's lion population were circulated by the Associated Press. The zoo spokesperson, Tobias Stenbaek Bro, has been quoted as saying that visitors, including children, were invited to watch as the giraffe was skinned and parts fed to the lions. "I'm actually proud because I think we have given children a huge understanding of the anatomy of a giraffe that they wouldn't have had from watching a giraffe in a photo," Stenbaek Bro said in a telephone interview with the Associated Press. On 25 March 2014, despite the backlash from the giraffe cull, the zoo euthanized four lions (two adults and two ten-month-old cubs). The zoo stated that they were introducing a male lion and did not want to disrupt the pride's natural structure and behaviour. The lions were not culled or dissected in public. 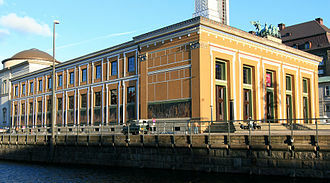 Copenhagen Zoo is used as location in the films Københavnere (1933), Wienerbarnet (1941), Hold fingrene fra mor (1951), Far til fire på landet (1955)m Vi er allesammen tossede (1959), Rikki og mændene (1962), Den store badedag (1991) and Far til fire på japansk (2010). The zoo is also used as location in episode 84 of the DR television show Huset på Christianshavn and in the TV2 television Christmas calendar Brødrenes Mortensen Jul. ^ a b Visit Denmark: Zoo. 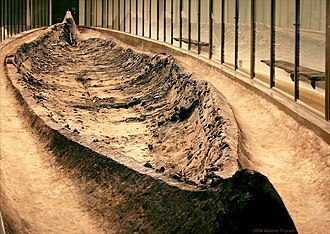 Retrieved 10 November 2012. ^ "EAZA Member Zoos & Aquariums". eaza.net. EAZA. Retrieved 27 May 2011. ^ "Zoos and Aquariums of the World". waza.org. WAZA. Retrieved 27 May 2011. ^ "Attraktionsstatistikken 2007 - top50" (PDF). Archived from the original (PDF) on 24 April 2012. Retrieved 11 April 2009. 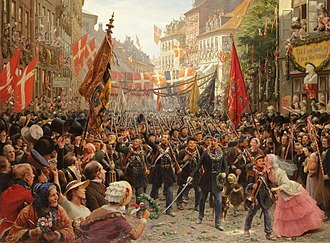 ^ "The `Exotic' as Mass Entertainment: Denmark 1878—1909". Rac.sagepub.com. 1 October 2003. Retrieved 10 February 2014. ^ "Slow Worm". Archived from the original on 2008-11-20. ^ "Bygninger". Københavns Zoo. Retrieved 23 January 2009. 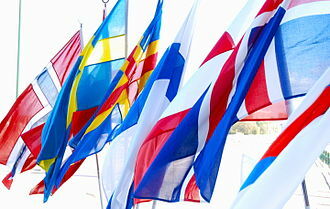 ^ "Bygninger". Københavns Zoo. Retrieved 11 April 2009. ^ Glancey, Jonathan (10 June 2008). 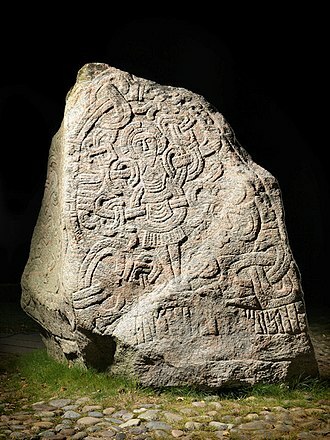 "Bygninger". London: Københavns Zoo. Retrieved 11 April 2009. ^ "Wait till you see our swimming pool!". The Guardian. Retrieved 12 April 2009. ^ Glancey, Jonathan (10 June 2008). "Wait till you see our swimming pool!". London: The Guardian. Retrieved 12 April 2009. ^ "Disease-plagued Tasmanian devils now endangered". Animal Planet. Archived from the original on 22 January 2010. Retrieved 6 January 2010. ^ Glaetzer, S. (5 January 2014). Denmark's Copenhagen Zoo plans to lead way in Tasmanian devil care. The Mercury. Retrieved 7 January 2014. ^ "Healthy giraffe killed at Copenhagen Zoo to prevent inbreeding". CTV news.ca. February 9, 2014. Retrieved February 10, 2014. ^ a b "BBC News - 'Surplus' giraffe put down at Copenhagen Zoo". BBC.co.uk. Retrieved 2014-02-10. ^ "Yorkshire Wildlife Park is saddened to... - Yorkshire Wildlife Park". Facebook. Retrieved 2014-02-10. ^ "Why did Copenhagen Zoo kill its giraffe?". BBC News. Retrieved 2014-02-10. ^ Steed R. and Rising, M. "Danish zoo kills giraffe to prevent inbreeding". Bigstory.ap.org. Retrieved 2014-02-10. ^ "Danish zoo kills healthy giraffe, feeds body to lions". CNN.com. 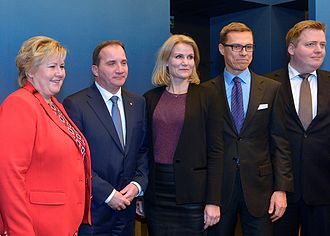 6 February 2014. Retrieved 10 February 2014. 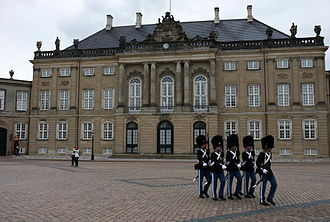 ^ a b "Zoologisk Have København". danskefilm.dk (in Danish). Retrieved 9 October 2017. ^ Kitchener, A.C.; Breitenmoser-Würsten, C.; Eizirik, E.; Gentry, A.; Werdelin, L.; Wilting, A. & Yamaguchi, N. (2017). "A revised taxonomy of the Felidae: The final report of the Cat Classification Task Force of the IUCN Cat Specialist Group" (PDF). Cat News. Special Issue 11. The Dalmatian pelican is a massive member of the pelican family. It breeds from southeastern Europe to India and China in swamps, the nest is a crude heap of vegetation. This huge bird is by a slight margin the largest of the pelican species and it measures 160 to 183 cm in length,7. 25–15 kg in weight and 245 to 351 cm in wingspan. A mean estimated body mass for the Dalmatian pelican of 10.9 kg was published, around the mass as the afforementioned largest swan. It appears to have one of the largest wingspans of any living bird, rivaling those of the great albatrosses, the Dalmatian differs from this other very large species in that it has curly nape feathers, grey legs and silvery-white plumage. In winter, adult Dalmatian pelicans go from silvery-grey to a dingier brownish-grey cream colour, immature birds are grey and lack the pink facial patch of immature white pelicans. The loose feathers around the forehead of the Dalmatian pelican can form a W-like-shape on the right above the bill. In the breeding season it has a lower mandible and pouch against a yellow upper mandible. In winter, the bill is a somewhat dull yellow. The bill, at 36 to 45 cm long, is the second largest of any bird, the bare skin around the eye can vary from yellow to purplish in colour. When the Dalmatian pelican is in flight, unlike other pelicans and it is an elegant soaring bird. When a whole flock of Dalmatian pelicans is in flight, all its members move in graceful synchrony, the Dalmatian pelican is found in lakes, rivers and estuaries. Compared to the white pelican, the Dalmatian is not as tied to lowland areas. It is less opportunistic in breeding habitat selection than the great white, during the winter, Dalmatian pelicans usually stay on ice-free lakes in Europe or jheels in India. They visit, typically during winter, inshore areas along sheltered coasts for feeding and this pelican usually migrates short distances. It is dispersive in Europe, based on feeding opportunities, with most western birds staying through the winter in the Mediterranean region, in the Danube Delta, Dalmatian pelicans arrive in March and leave by the end of August. Turtles are reptiles of the order Testudines characterised by a special bony or cartilaginous shell developed from their ribs and acting as a shield. Turtle may refer to the order as a whole or to fresh-water, the order Testudines includes both extant and extinct species. 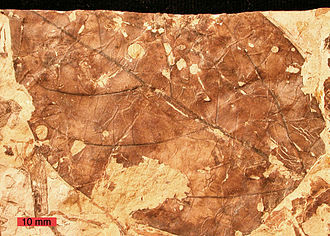 The earliest known members of this date from 157 million years ago, making turtles one of the oldest reptile groups. Of the 327 known species alive today, some are highly endangered, turtles are ectotherms—animals commonly called cold-blooded—meaning that their internal temperature varies according to the ambient environment. However, because of their metabolic rate, leatherback sea turtles have a body temperature that is noticeably higher than that of the surrounding water. Turtles are classified as amniotes, along with reptiles, birds. Like other amniotes, turtles breathe air and do not lay eggs underwater, Chelonia is based on the Greek word χελώνη chelone tortoise, denoting armor or interlocking shields, testudines, on the other hand, is based on the Latin word testudo tortoise. Turtle may either refer to the order as a whole, or to particular turtles that make up a form taxon that is not monophyletic, the meaning of the word turtle differs from region to region. In North America, all chelonians are commonly called turtles, including terrapins, in Great Britain, the word turtle is used for sea-dwelling species, but not for tortoises. The term tortoise usually refers to any land-dwelling, non-swimming chelonian, most land-dwelling chelonians are in the Testudinidae family, only one of the 14 extant turtle families. Terrapin is used to describe several species of small, hard-shell turtles, typically found in brackish waters. Some languages do not have this distinction, as all of these are referred to by the same name, for example, in Spanish, the word tortuga is used for turtles and terrapins. A sea-dwelling turtle is tortuga marina, a freshwater species tortuga de río, the largest living chelonian is the leatherback sea turtle, which reaches a shell length of 200 cm and can reach a weight of over 900 kg. 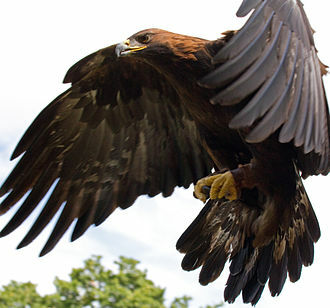 Eagle is a common name for many large birds of prey of the family Accipitridae, it belongs to several groups of genera that are not necessarily closely related to each other. Most of the 60 species of eagles are from Eurasia and Africa, outside this area, just 14 species can be found – two in North America, nine in Central and South America, and three in Australia. Eagles are large, powerfully built birds of prey, with heavy heads, most eagles are larger than any other raptors apart from some vultures. The smallest species of eagle is the South Nicobar serpent eagle, the largest species are discussed below. Like all birds of prey, eagles have large, hooked beaks for ripping flesh from their prey, muscular legs. The beak is typically heavier than that of most other birds of prey, Eagles eyes are extremely powerful, having up to 3.6 times human acuity for the martial eagle, which enables them to spot potential prey from a very long distance. This keen eyesight is primarily attributed to their extremely large pupils which ensure minimal diffraction of the incoming light, the female of all known species of eagles is larger than the male. Eagles normally build their nests, called eyries, in trees or on high cliffs. Many species lay two eggs, but the older, larger chick frequently kills its younger sibling once it has hatched, the dominant chick tends to be a female, as they are bigger than the male. The parents take no action to stop the killing, due to the size and power of many eagle species, they are ranked at the top of the food chain as apex predators in the avian world. 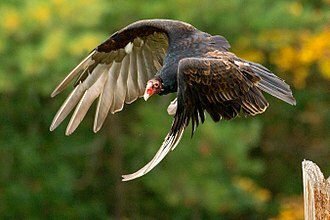 The type of prey varies by genus, the snake and serpent eagles of the genera Circaetus and Spilornis predominantly prey on the great diversity of snakes found in the tropics of Africa and Asia. The eagles of the genus Aquila are often the top birds of prey in open habitats, where Aquila eagles are absent, other eagles, such as the buteonine black-chested buzzard-eagle of South America, may assume the position of top raptorial predator in open areas. 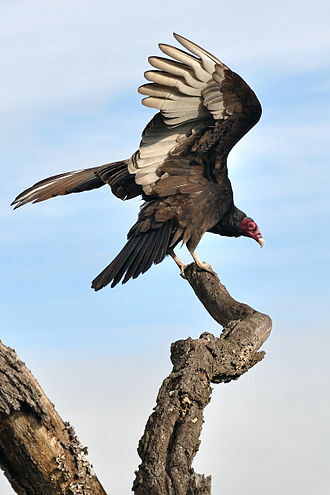 Many other eagles, including the species-rich Spizaetus genus, live predominantly in woodlands and these eagles often target various arboreal or ground-dwelling mammals and birds, which are often unsuspectingly ambushed in such dense, knotty environments. The lion is one of the big cats in the genus Panthera and a member of the family Felidae. The commonly used term African lion collectively denotes the several subspecies in Africa, with some males exceeding 250 kg in weight, it is the second-largest living cat after the tiger. Wild lions currently exist in sub-Saharan Africa and in India, in ancient historic times, their range was in most of Africa, including North Africa, and across Eurasia from Greece and southeastern Europe to India. Lion populations are untenable outside designated reserves and national parks, although the cause of the decline is not fully understood, habitat loss and conflicts with humans are the greatest causes of concern. Within Africa, the West African lion population is particularly endangered, in the wild, males seldom live longer than 10 to 14 years, as injuries sustained from continual fighting with rival males greatly reduce their longevity. In captivity they can more than 20 years. They typically inhabit savanna and grassland, although they may take to bush, Lions are unusually social compared to other cats. A pride of lions consists of related females and offspring and a number of adult males. Groups of female lions typically hunt together, preying mostly on large ungulates, Lions are apex and keystone predators, although they are expert scavengers obtaining over 50 percent of their food by scavenging as opportunity allows. While lions do not typically hunt humans, some have, sleeping mainly during the day, lions are active primarily at night, although sometimes at twilight. 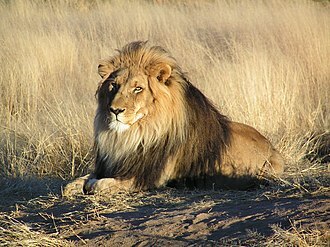 Highly distinctive, the lion is easily recognised by its mane. 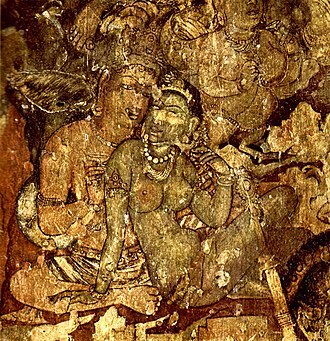 It has been depicted in sculptures, in paintings, on national flags. Lions have been kept in menageries since the time of the Roman Empire, Zoos are cooperating worldwide in breeding programs for the endangered Asiatic subspecies. The lions name, similar in many Romance languages, is derived from the Latin leo, the Hebrew word לָבִיא may be related. 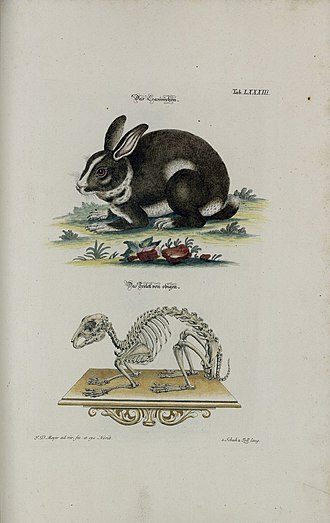 It was one of the originally described by Linnaeus, who gave it the name Felis leo, in his eighteenth-century work. The lions closest relatives are the species of the genus Panthera, the tiger, the snow leopard, the jaguar. P.
The Humboldt penguin is a South American penguin that breeds in coastal Chile and Peru. Its nearest relatives are the African penguin, the Magellanic penguin, the penguin is named after the cold water current it swims in, which is itself named after Alexander von Humboldt, an explorer. The species is listed as Vulnerable by the IUCN, Humboldt penguins are medium-sized penguins, growing to 56–70 cm long and a weight of 3. 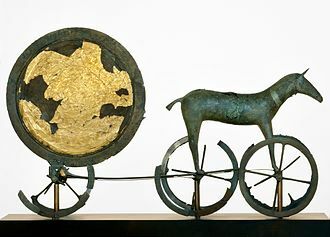 6-5.9 kg. They have a head with a white border that runs from behind the eye, around the black ear-coverts and chin. 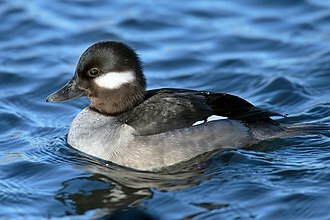 They have blackish-grey upperparts and whitish underparts, with a black breast-band that extends down the flanks to the thigh and they have a fleshy-pink base to the bill. 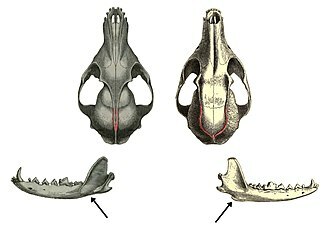 Juveniles have dark heads and no breast-band and they have spines on their tongue which they use to hold their prey. Humboldt penguins nest on islands and rocky coasts, burrowing holes in guano, in South America the Humboldt penguin is found only along the Pacific coast, and the range of the Humboldt penguin overlaps that of the Magellanic penguin on the central Chilean coast. It is vagrant in Ecuador and Colombia, due to a declining population caused in part by over-fishing, climate change, and ocean acidification, the current status of the Humboldt penguin is threatened. Historically it was the victim of guano over-exploitation, penguins are declining in numbers due to habitat destruction including by invasive species. The current population is estimated at between 3,300 and 12,000, in August 2010 the Humboldt penguin of Chile and Peru, was granted protection under the U. S. In 2009 at a zoo in Bremerhaven, two adult male Humboldt penguins adopted an egg that had abandoned by its biological parents. After the egg hatched, the two penguins raised, cared for, and fed the chick in the manner that heterosexual penguin couples raise their own offspring. One of the 135 Humboldt penguins from Tokyo Sea Life Park thrived in Tokyo Bay for 82 days after apparently scaling the 13 foot high wall, the penguin, known only by its number, was recaptured by the zoo keepers in late May 2012. The California sea lion is a coastal eared seal native to western North America. It is one of five species of sea lion and its natural habitat ranges from southeast Alaska to central Mexico, including the Gulf of California. Sea lions are sexually dimorphic, males are larger than females and they mainly haul-out on sandy or rocky beaches, but they frequent manmade environments such as marinas and wharves. Sea lions feed on a number of species of fish and squid, California sea lions have a polygynous breeding pattern. From May to August, males establish territories and try to attract females with which to mate, females are free to move in between territories, and are not coerced by males. Mothers nurse their pups in between foraging trips, sea lions communicate with numerous vocalizations, notably with barks and mother-pup contact calls. Outside of their season, sea lions spend much of their time at sea. Sea lions are particularly intelligent, can be trained to various tasks. Because of this, California sea lions are a choice for public display in zoos and oceanariums. The International Union for Conservation of Nature lists the species as Least Concern due to its abundance, predation by California sea lions on threatened or endangered salmon species at Bonneville Dam has resulted in more than 50 of them being killed by state officials. The California sea lion was described by René Primevère Lesson, a French naturalist and it is grouped with other sea lions and fur seals in the family Otariidae. Otariids, known as eared seals, differ from true seals in having external ear flaps and this refers to the protruding sagittal crest of the males, which distinguishes members of the genus. Traditionally, the Galapagos sea lion and Japanese sea lion were classified as subspecies of the California sea lion, however, a genetic study in 2007 found that all three are in fact separate species. 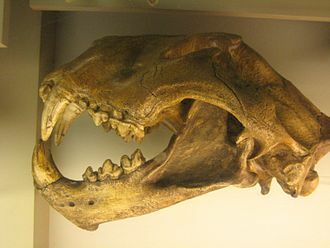 The lineages of the California and Japanese sea lion appear to have split off 2.2 million years ago during the Pliocene, the California sea lion differs from the Galapagos sea lion in its greater sexual dimorphism. The domestic yak is a long-haired domesticated bovid found throughout the Himalaya region of southern Central Asia, the Tibetan Plateau and as far north as Mongolia and Russia. 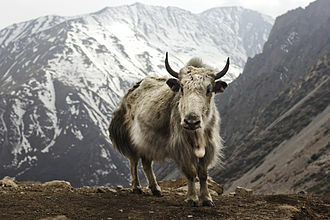 It is descended from the wild yak, the English word yak is a loan originating from Tibetan, གཡག་, Wylie, g. yag. In Tibetan, it only to the male of the species. In English, as in most other languages that have borrowed the word, Yaks belong to the genus Bos and are therefore related to cattle. Mitochondrial DNA analyses to determine the history of yaks have been inconclusive. Except where the wild yak is considered as a subspecies of Bos grunniens, Yaks are heavily built animals with a bulky frame, sturdy legs, and rounded cloven hooves, and extremely dense, long fur that hangs down lower than the belly. While wild yaks are generally dark, blackish to brown, in colouration, domestic yaks can be variable in colour, often having patches of rusty brown. They have small ears and a forehead, with smooth horns that are generally dark in colour. In males, the horns sweep out from the sides of the head, the horns of females are smaller, only 27 to 64 cm in length, and have a more upright shape. Both sexes have a neck with a pronounced hump over the shoulders, although this is larger. Males weigh 350 to 580 kg, females weigh 225 to 255 kg, wild yaks can be substantially heavier, males reaching weights of up to 1,000 kilograms. Both sexes have long hair with a dense woolly undercoat over the chest, flanks. Especially in males, this may form a skirt that can reach the ground. The tail is long and horselike rather than tufted like the tails of cattle or bison, domesticated yaks have a wide range of coat colours, with some individuals being white, brown, roan or piebald. The udder in females and the scrotum in males are small and hairy, Yaks grunt and, unlike cattle, are not known to produce the characteristic bovine lowing sound, which inspired the scientific names of both yak variants, Bos grunniens and Bos mutus. Conversely, yaks do not thrive at lower altitudes, and begin to suffer from heat exhaustion above about 15 °C, further adaptations to the cold include a thick layer of subcutaneous fat, and an almost complete lack of functional sweat glands. 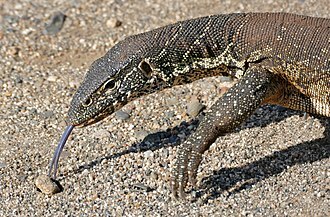 Lizards are a widespread group of squamate reptiles, with over 6,000 species, ranging across all continents except Antarctica, as well as most oceanic island chains. 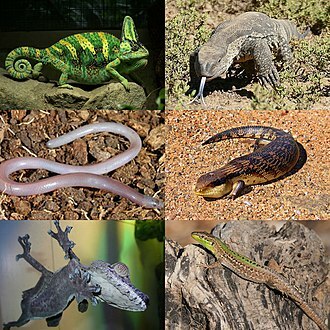 The group is paraphyletic as it excludes the snakes which are squamates, Lizards typically have four legs feet and external ears, though some are legless, while snakes lack both of these characteristics. 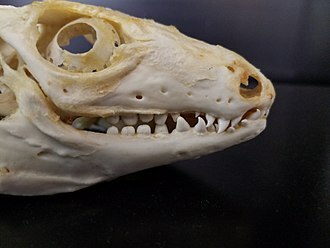 Lizards and snakes share a movable quadrate bone, distinguishing them from the sphenodonts, Lizards form about 60% of all the species of extant non-avian reptiles. 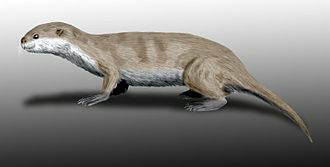 Some extinct varanids reached great size, The giant monitor Megalania is estimated to have reached up to 7 m long, including color vision, is particularly well developed in most lizards. Most lizards communicate using body language, using specific postures and movements to define territory, resolve disputes, some species of lizards use pheromones or bright colors, such as the iridescent patches on the belly of Sceloporus. 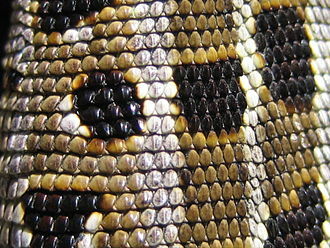 These colors are visible to predators, so are often hidden on the underside or between scales and only revealed when necessary. The particular innovation in this respect is the dewlap, a colored patch of skin on the throat. When a display is needed, a lizard can erect the hyoid bone of its throat, anoles are particularly famous for this display, with each species having specific colors, including patterns only visible under ultraviolet light, as many lizards can see UV light. Lizard tails are often a different and dramatically more vivid color than the rest of the body so as to potential predators to strike for the tail first. Many lizards, including geckos and skinks, are capable of shedding part of their tails through a process called autotomy. This is an example of the pars pro toto principle, sacrificing a part for the whole, the detached tail writhes and wiggles, creating a deceptive sense of continued struggle, distracting the predators attention from the fleeing prey animal. The lizard partially regenerates its tail over a period of weeks, a 2014 research identified 326 genes involved in the regeneration of lizard tails. Norman Robert Foster, Baron Foster of Thames Bank, OM, HonFREng is a British architect whose company, Foster + Partners, maintains an international design practice famous for high-tech architecture. He is one of Britains most prolific architects of his generation, in 1999, he was awarded the Pritzker Architecture Prize, often referred to as the Nobel Prize of architecture. In 2009, Foster was awarded the Prince of Asturias Award in the Arts category, in 1994, he received the AIA Gold Medal. Foster was born to Robert Foster and Lilian Smith in 1935 in Reddish and they moved, soon after his birth, two miles to 4 Crescent Grove in Levenshulme, which they rented for fourteen shillings a week, Foster has no recollection of Reddish. He attended Burnage Grammar School for Boys in Burnage, in a Guardian interview in 1999, Foster said he always felt different at school and was bullied and he retired into the world of books. He considered himself quiet and awkward in his early years often making faux pas and he was fascinated with engineering and the process of designing. He says that caused him to pursue a career designing buildings, specific interests included aircraft, a hobby he maintains today, and trains, generated by viewing passing trains on the railway outside his terraced home during his childhood. Fosters father convinced him to take the exam for Manchester Town Halls trainee scheme which he passed in 1951. A colleague, Mr Cobbs son, was studying architecture and his interest led to Foster considering a career in architecture. 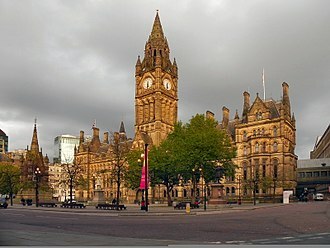 After working in the Manchester City Treasurers office, Foster completed his National Service in 1953 serving in the Royal Air Force, Foster returned to Manchester, not wanting to return to the town hall as his parents wished and unsure of which path to follow. 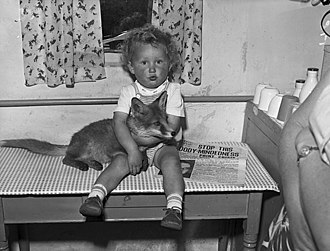 Foster was searching for an away from his working-class roots which led to the alienation of his parents. Foster took a job as assistant to a manager with John Bearshaw and Partners. The staff advised him, that if he wished to become an architect, he should prepare a portfolio of drawings using the perspective, Bearshaw was so impressed with the drawings that he promoted the young Foster to the drawing department of the practice. Foster ventured around Manchester observing buildings. 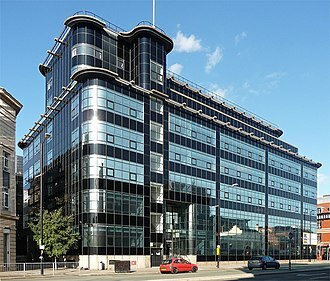 The art deco Express Building in Manchester was a building that intrigued him. This image from Pacific Lutheran University shows the cervical vertebrae of a Cryptodire as seen ventrally. The vertebrae have an S-shaped curve to allow for neck retraction into the shell. A caricature of Saartjie Baartman, called the Hottentot Venus. Born to a Khoisan family, she was displayed in London in the early 19th century. Evolutionary relationships among hippo and Cetacea (whales, dolphins). 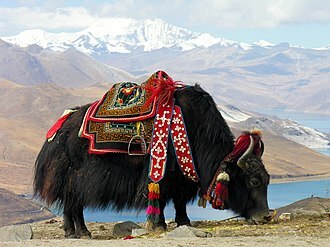 A domestic yak at Yamdrok Lake.